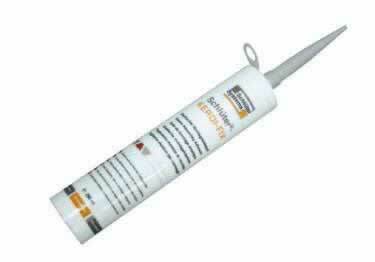 Seal, bond or fill joints with KERDI-FIX single-component sealing and bonding compound. Constructed with a silane-modified polymer base, KERDI-FIX is UV and weather-resistant, contains not solvents and is odor neutral. It is elastomeric and bonds great to most materials including wood, stone, concrete, metal, glass, and many plastics. Great for bonding Schluter KERDI-BAND and Schluter-KERDI waterproofing membrane to fixed building elements, and for bonding Schluter -BARA balcony profiles. KERDI-FIX may also be used as a sealant or joint filing compound. Seal, bond or fill joints with KERDI-FIX single-component sealing and bonding compound. Constructed with a silane-modified polymer base, KERDI-FIX is UV and weather-resistant, contains not solvents and is odor neutral. It is elastomeric and bonds great to most materials including wood, stone, concrete, metal, glass, and many plastics. Seal pipes, mixing valves and other protruding elements with pre-cut seals constructed from Schluter KERDI waterproof membrane.